I know this guy! OK, we met once for an autograph and picture during a MOPS convention a few years ago. That counts though! What a humble human being. He sat there for over an hour saying hello and taking pictures with all the moms at that convention. I am so excited about this new album. My son and I have been jamming out to it on our 30 min drives to and from school every day. Choose to be ALL IN! 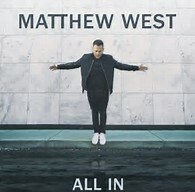 Matthew launched a 6-week All In Challenge on his social media on 9/18, and each week Matthew is challenging his fans to go "All In" in a different part of their lives. What does it look like when a heart that knows Jesus takes a step and holds nothing back? How can we go All In in the places that mean the most? It's never too late to start this challenge. One of my son's favorite songs on this album is Amen. Maybe you just need a copy of this CD for yourself! It will be great motivation! You can buy your copy here on iTunes, or try and win a free copy first.